Manchester, 2025. Local mechanic Sol steals old vehicles to meet the demand for spares. But when Sol's partner impulsively jacks a luxury model, Sol finds himself caught up in a nightmarish trans-dimensional human trafficking conspiracy.Hidden in the stolen car is a voiceless, three-armed woman called Y. She's had her memory removed and undertaken a harrowing journey into a world she only vaguely recognises. And someone waiting in the UK expects her delivery at all costs.Now Sol and Y are on the run from both Y's traffickers and the organisation's faithful products. 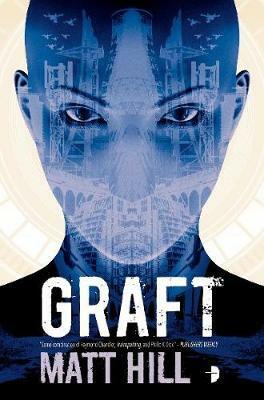 With the help of a dangerous triggerman and Sol's ex, they must uncover the true, terrifying extent of the trafficking operation, or it's all over.Not that there was much hope to start with.A novel about the horror of exploitation and the weight of love, Graft imagines a country in which too many people are only worth what's on their price tag. Matt Hill was born in 1984 and grew up in Tameside, Greater Manchester. After completing a journalism degree at Cardiff University, he trained as a copywriter. He now lives and works in London. His first novel, The Folded Man, was runner-up in the 2012 Dundee International Book Prize.